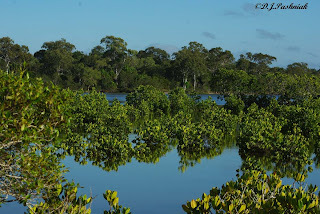 The other day I had a trip over to Fraser Island. 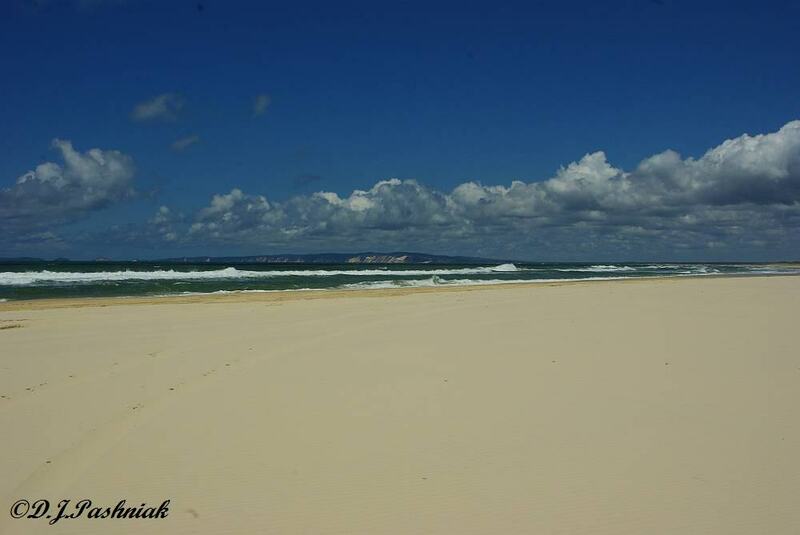 (For the benefit of overseas readers Fraser Island is the largest sand island in the world and is World Heritage listed.) 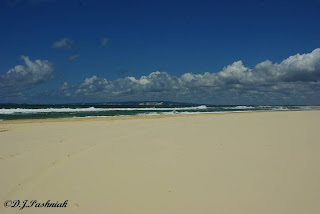 I frequently go to Inskip Point and look across the channel at Fraser Island but had never been across there before. 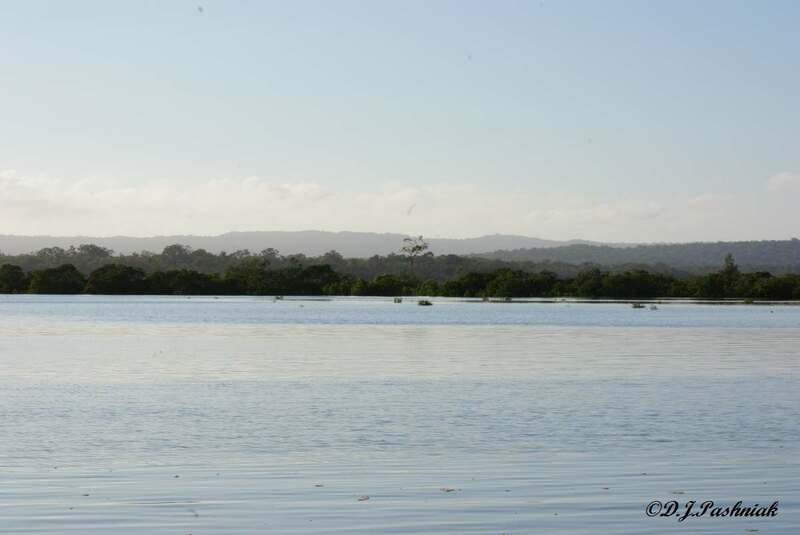 A number of times while observing and photographing the shorebirds at Inskip I have seen flocks of birds, which have been disturbed by boats, or people, heading north-east across the channel to Fraser Island. I had been told that birds roosted at Hook Point and I wondered if this was where the shorebirds went when disturbed at Inskip Point. I wouldn't have managed any part of this trip without the help and advice of DERM (Department of Environment and Resource Management) and QPWS (Queensland Parks and Wildlife Service) personnel. 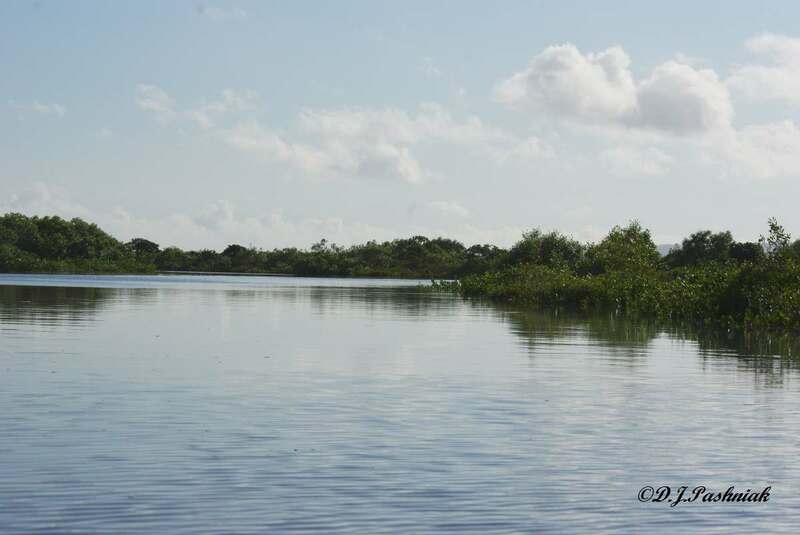 Moyra is involved in the management strategy for shorebirds in the Sandy Strait and she arranged for Ivan - who has an enormous amount of knowledge about the island and its wildlife - to meet us over there. Thanks to both! 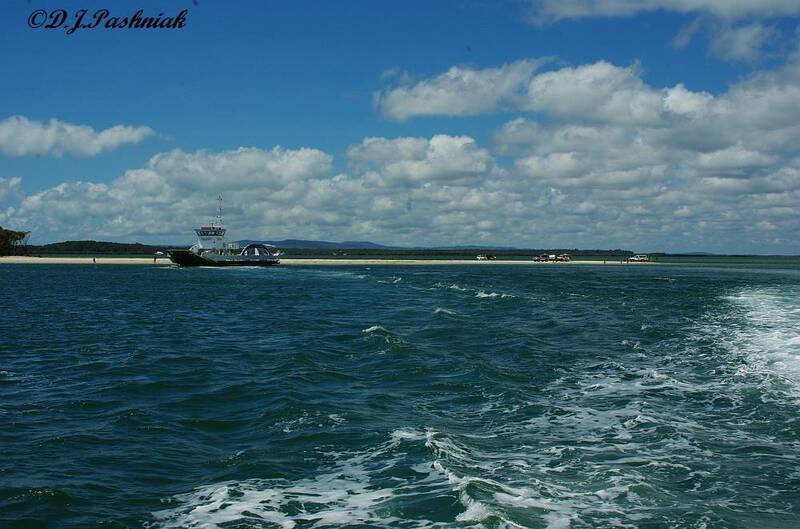 We took the barge from Inskip Point to the island. 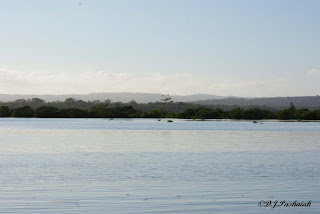 This photo looks back to Inskip Point where I usually stand and watch the barges! Although we still had about 2 hours to go until high tide it was impossible to drive north on the beach. 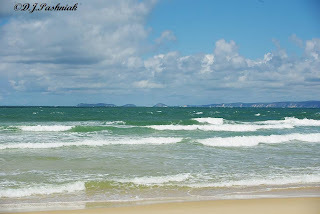 There just wasn't enough beach left out of the water! (btw I was very glad that I didn't have to do the driving as I have no experience with 4 wheel drives - and I am now not at all sure that I want it! Most of it was fun but some of it was a bit "dicey"! Moyra did a great job at all this!) 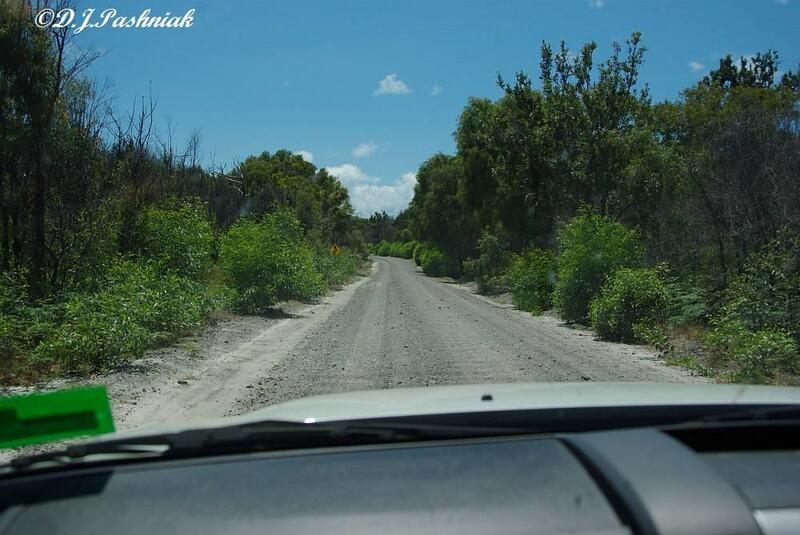 The inland route is well graveled but extremely corrugated. These two photos were taken through the front window of the vehicle. Ivan advised us how to access part of the beach north of Hook Point where there was a good wide stretch of beach well above the high tide mark for the day. He also suggested that we drive north to where he had frequently seen birds roosting along the edge of the beach. 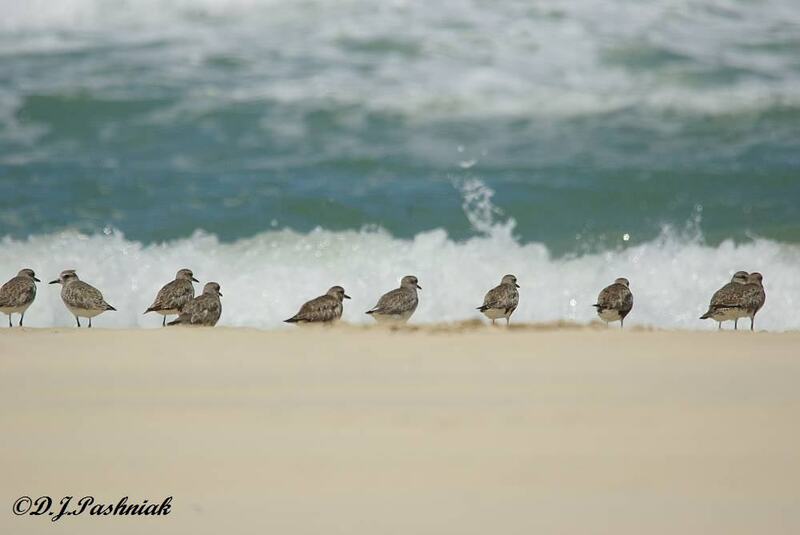 The first birds that we came to were a small (100-200) flock of terns and a smaller flock of shorebirds. 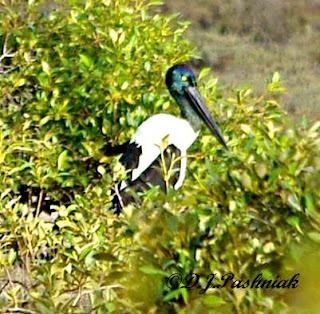 We parked well away so we didn't disturb them and then I went closer with binoculars and camera to get a better look. 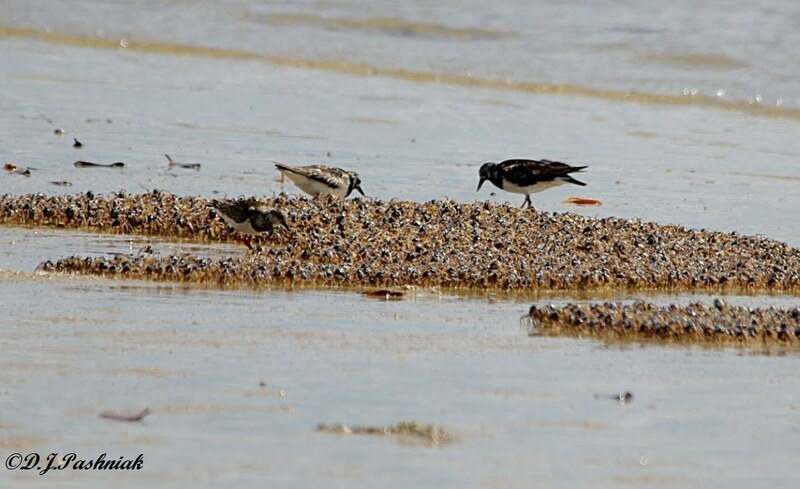 The shorebirds were Grey Plovers - just over 50 of them. I have never seen flocks of these birds on any roosts in the Strait. 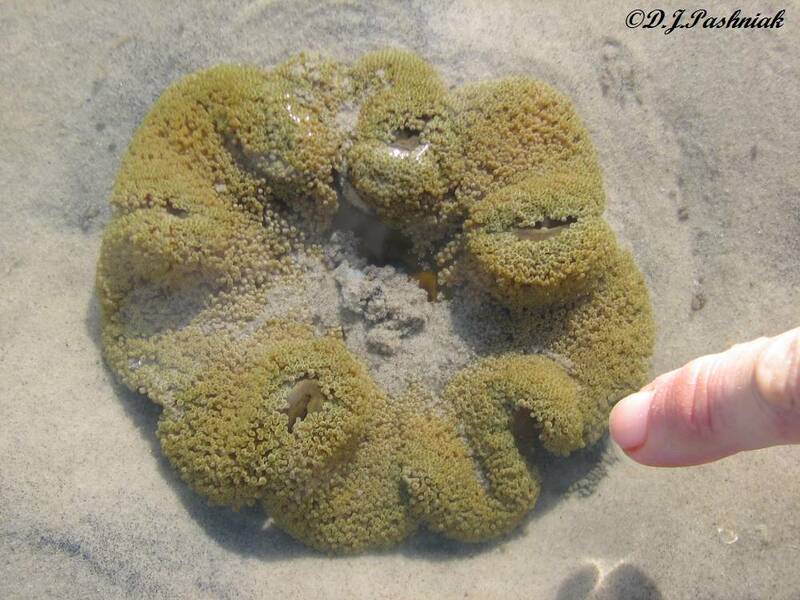 These ones were standing just out of reach of the breaking waves and just over a lip of sand which made them hard to see and photograph. Some of the birds still had dark patches of breeding plumage visible on their white fronts. 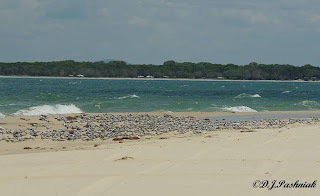 We drove north again but apart from flocks of thousands of terns we saw no more shorebirds. Then we headed south right down to Hook Point and again all we saw were terns - and one or two Whimbrels. 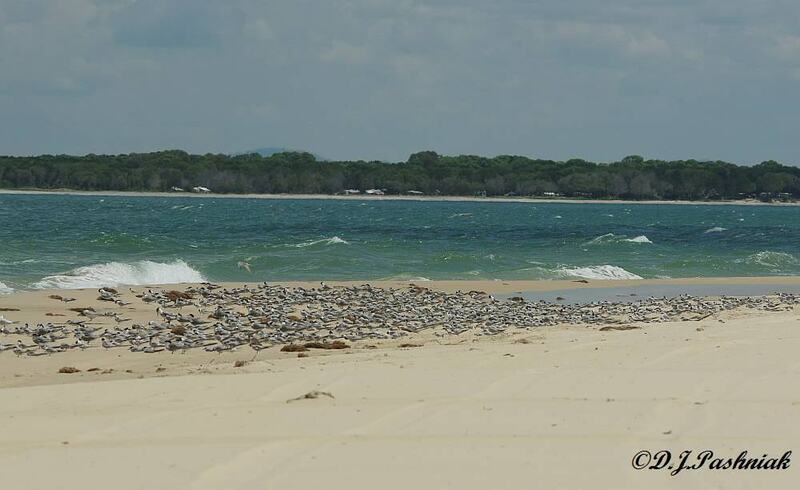 Part of a flock of terns- looking across the channel to the Inskip Point camp ground. 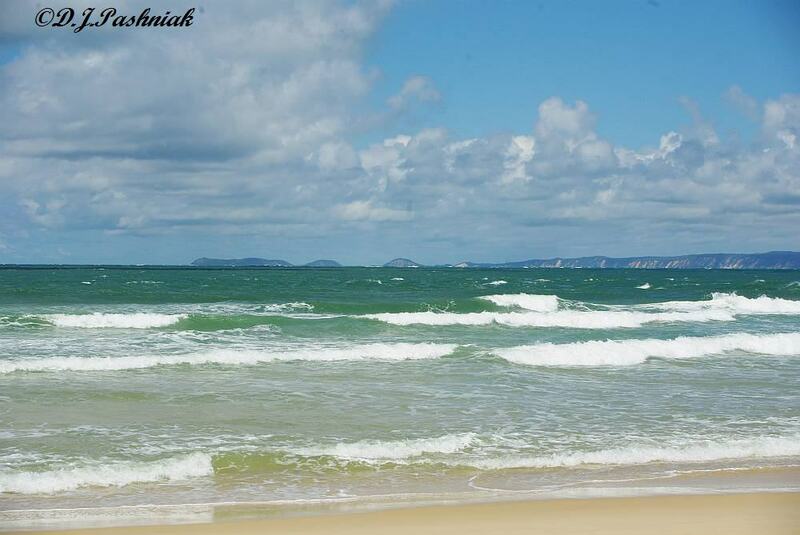 Looking south to the colored sand cliffs south of Rainbow Beach and Double Island Point in the distance. So I am left with more questions than answers. 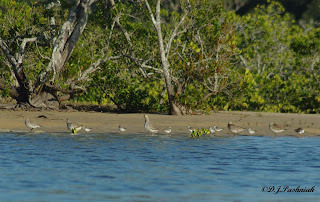 Where do the shorebirds go when I have seen them flying off from Inskip Point? Do they only roost in the Hook Point area when there is absolutely nowhere else for them to go? It is very open and not the kind of place where shorebirds prefer to roost. 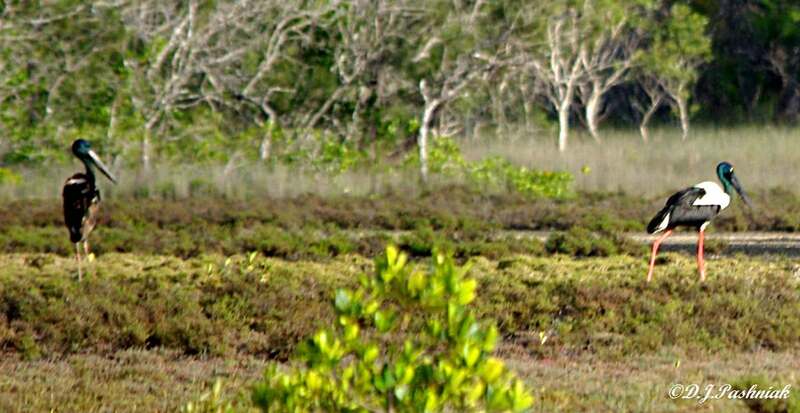 Of course Fraser Island is also known for being home to numbers of dingoes. 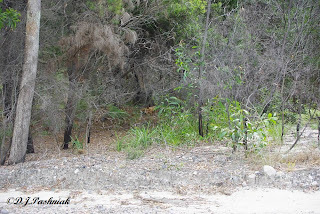 I was so intent on looking for birds that I didn't even try to see a dingo. We had stopped both vehicles and were having a final consultation when a dingo walked out of the bush right beside us! 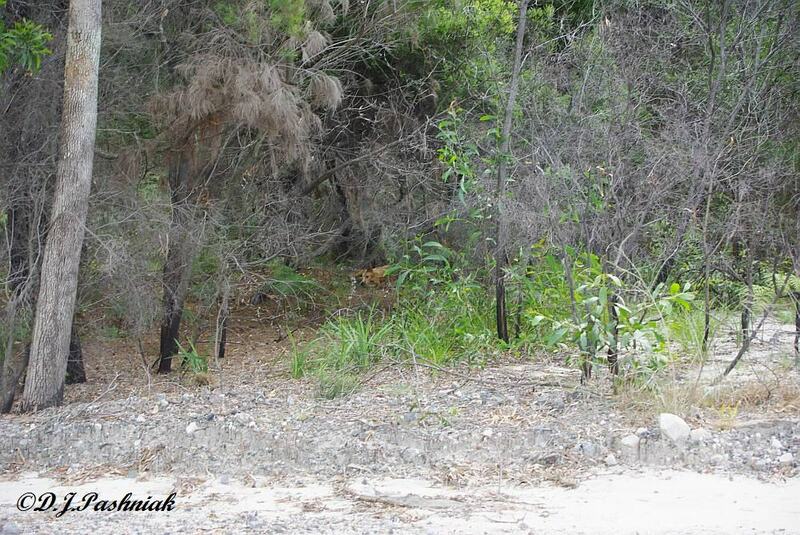 Then it strolled across the road and sat down in the bush just across from us and watched us. Where's my camera? Grab it! Quick take a photo even though it's not the right lens. Do I have enough time to put the long lens on the camera again? 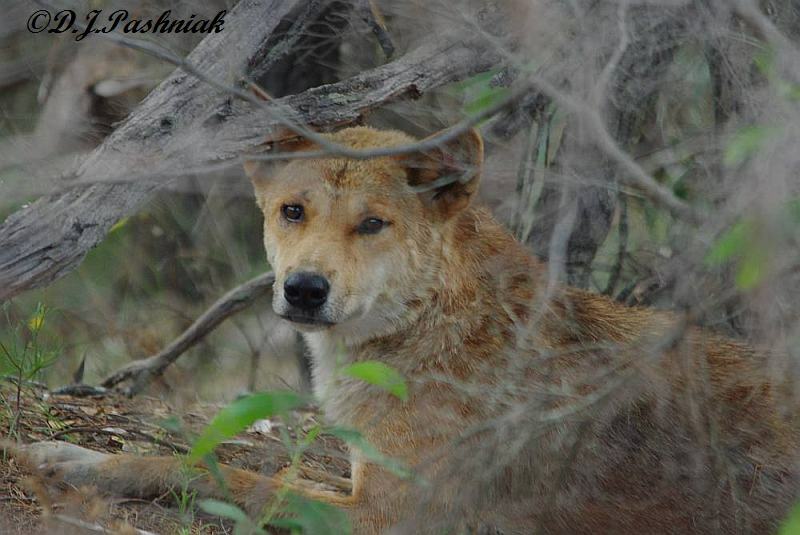 The dingo stayed put and I got my photo! Sarah phoned me last night to say that she and Graham had seen a Tawny Frogmouth sitting on a nest in one of the big Gums next to their house. 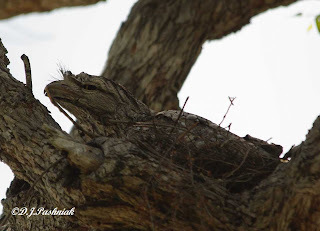 The previous photos I have taken of Frogmouths have been in another friend's yard on the other end of town so I was interested to see where this other pair was nesting. The nest was high in the tree and when I first saw it and took a photo the bird was standing high on the nest. 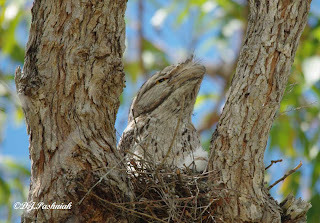 I walked around the tree and as I walked the bird sank down low over the nest and just moved its head to watch me. It was not until I got home and put the photos up on the computer that I realized I could see a tiny baby bird just under the parent in the first photo. I can see another patch of very white feathers under the bird and it may be another young one. What a great start to my morning! 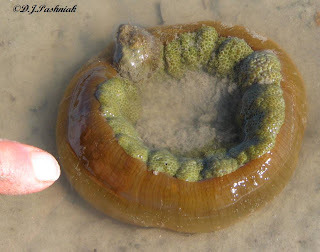 I have left these photos quite large when you click on them. 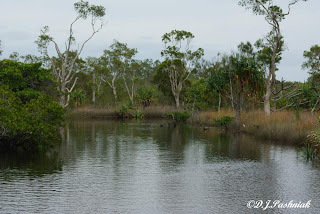 I kayaked over to the Crab Creek site to do a count on Friday of last week. The numbers of Bar-tailed Godwits (Limosa lapponica baueri) had more than doubled since the last count (a month ago) and there were increasing numbers of other birds as well. It was good to see numbers of juvenile Godwits scattered right through the flock. Juveniles leave Alaska approx. 2-3 weeks after the adults leave. 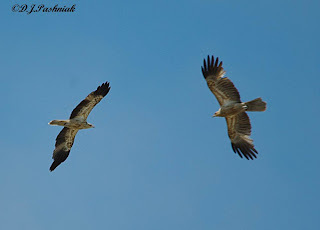 When they arrive here they are still in plumage which makes it fairly easy to see them. They will only keep this plumage for a little while and within a couple of months will have the usual adult non-breeding plumage. In the first photo the bird on the left front is a juvenile. 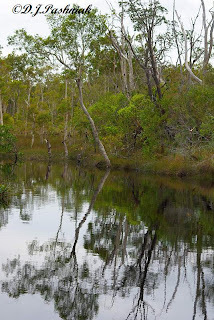 We got out of the kayaks as soon as we reached the other side as there is an interesting piece of saltmarsh there. When we stepped out onto the sandbank there were recent dog footprints in the sand. 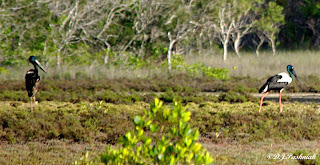 This is a long way from any houses so it might have been a wild dog or more likely a dingo. 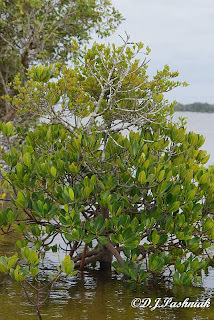 There were several interesting mangrove trees growing close to the edge of the water. They looked quite normal on the bottom part but the top portion of growth and leaves were quite different. The leaves were much smaller and a slightly different color. I wonder if some pollution in the water might have done this? 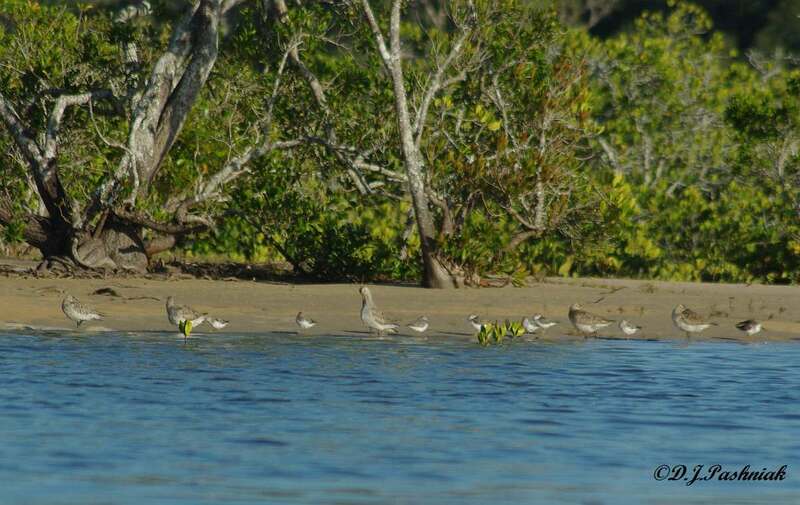 Usually there are quite large numbers of Whimbrels in the mangroves where the creek runs into the bay but we didn't see any at all this morning. However, we did see 23 Grey-tailed Tattlers and a couple of Little Egrets which made noises which sounded as if they were objecting to us invading their space. We kayaked right up to where there is a bridge crossing the creek. Even on a dark and dingy morning like this morning it is a beautiful place. I enjoyed the trip along the bay - BUT - next time I will do this kayak later in the summer when I have had a chance to get rid of some of the winter stiffness! I measured the distance on Google Earth and it was a round trip of 9 Kms. - a little much for right now. It's always interesting to be asked to go and identify a strange bird in someone’s yard. However, the phone call I had yesterday was especially interesting. Helen phoned to say that she and Steve had a small bird nesting right on their driveway and they thought it looked like a shorebird. 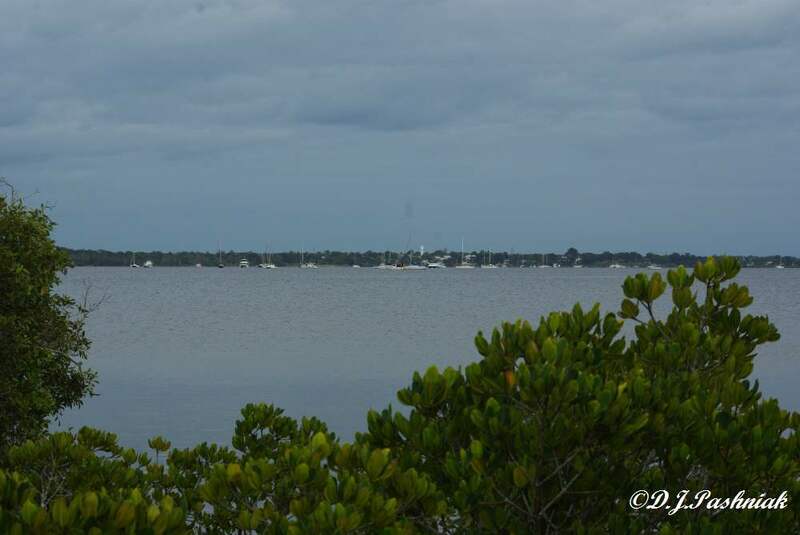 As soon as possible I got in the car and drove over to Tin Can Bay to the address they had given me. 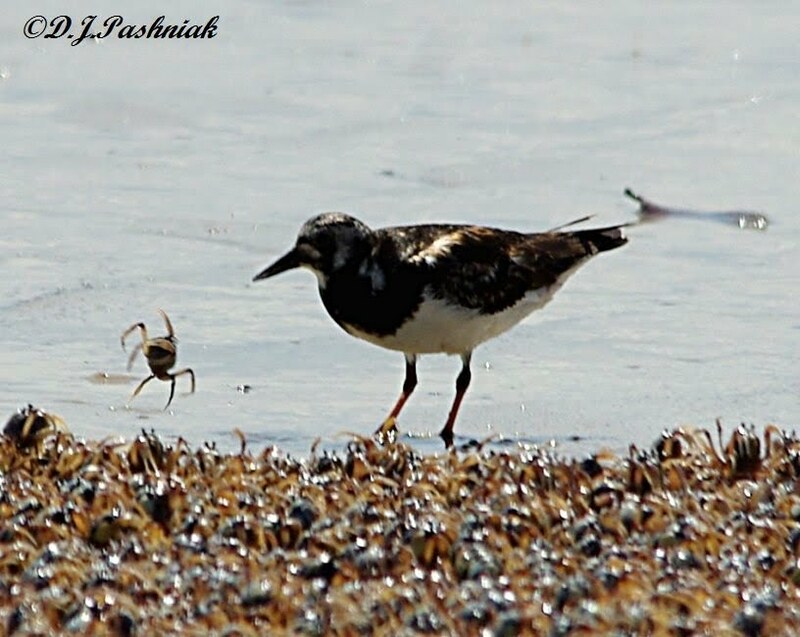 It was a most unlikely place to find a shorebird – several blocks back from the shoreline – and shorebirds like to stay close to the water! Their driveway has a median strip of stones between the concrete and as I got out of the car I saw a little dark ‘bump’ only a little bit bigger than the surrounding stones. 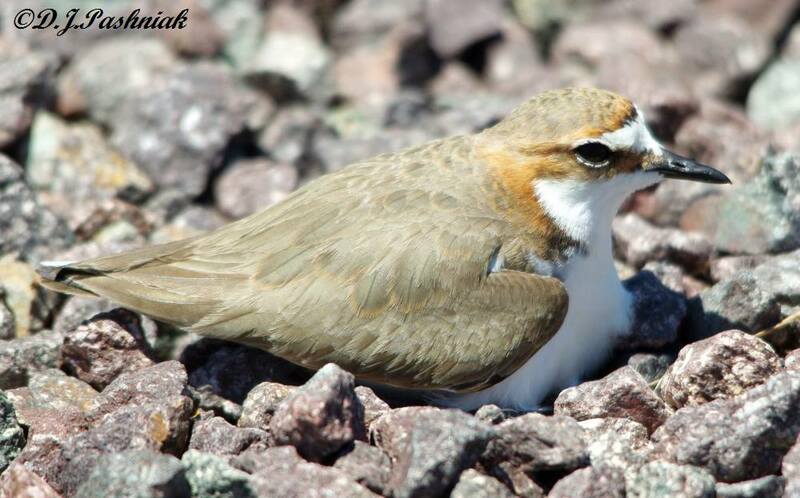 This was the bird – a Red-capped Plover. For a nest the bird had a tiny depression between the stones. The bird had become used to sharing the yard with humans and it did not move from the nest the whole time I was there. I went quite close to get photos and it did lift up just enough for me to glimpse two eggs under it. 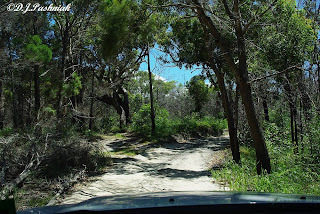 Helen said that their road is quiet and there appeared to be no roaming cats and dogs. Here's hoping that this bird manages to raise its young from this most unusual nesting place. 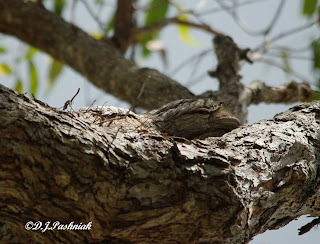 I very seldom find birds resting in a position that is good for photographs! 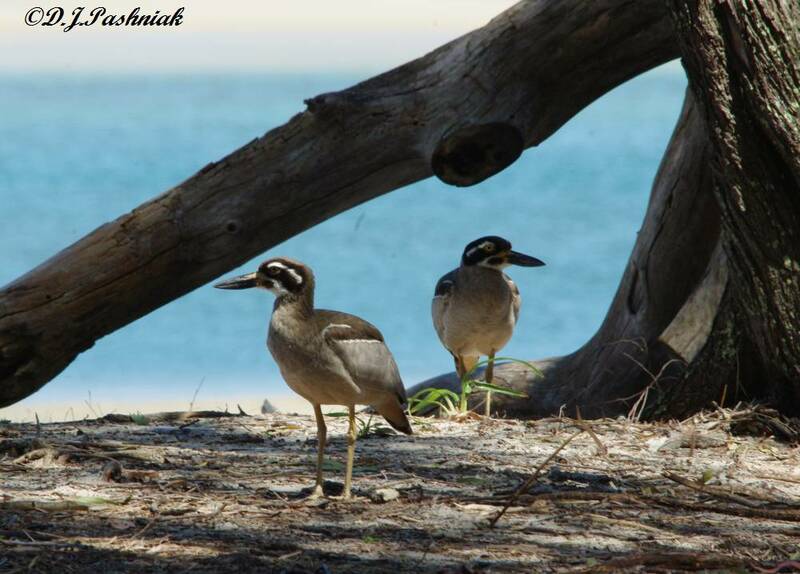 However, these Beach Stone-curlews (Esacus magnirostris) were standing right out at the end of the bush track at Inskip Point overlooking the water. 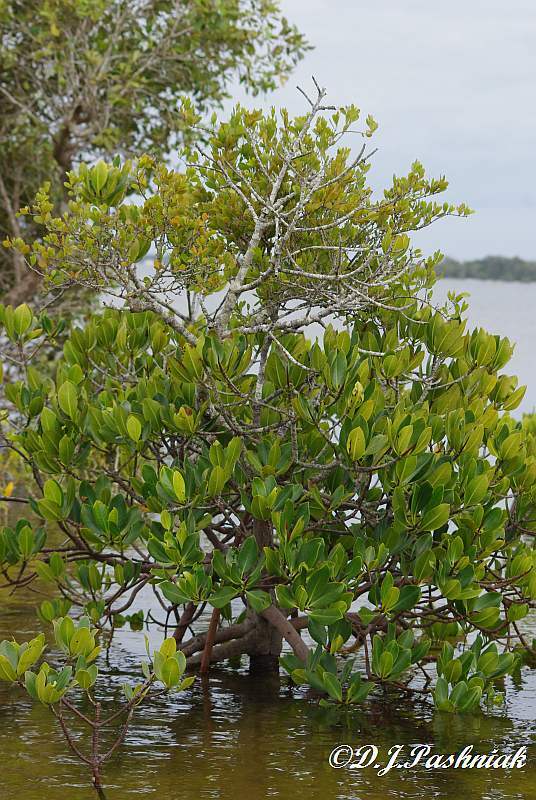 The large trees behind them have been under-cut by high tides last season and it is possible that the trees still standing will go in the next lot of high tides and high winds. When I finished taking photos I backed off slowly and the birds walked towards me until they reached a very thick piece of undegrowth and then they disappeared very quickly. 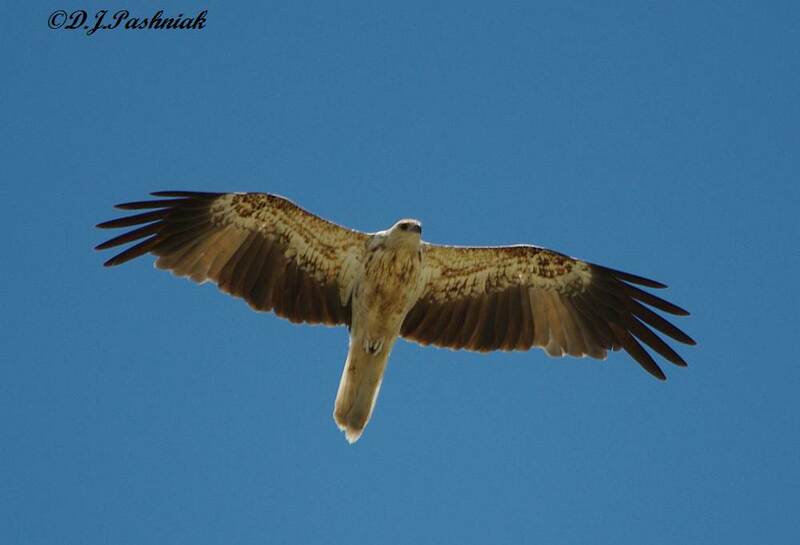 Out at the water's edge I saw a Whistling Kite (Milvus sphenurus) wheeling overhead. I was following it with the camera when I realized that there were two birds in the frame. Unfortunately I wasn't quite fast enough to change the focus and the bird on the right is slightly out of focus. However, I did get some good photos of one bird right overhead where I could see the beautiful patterns on the under wings. Who was it that said "...To err is human..." ? Denis pointed out that I had made a major error in naming a Whistling Kite an Osprey. I have now corrected the blog above to name the bird correctly. Thanks Denis! In future I will double check! I really enjoy seeing Rainbow Lorikeets around my yard. However, a number of my blogging colleagues have said that Lorikeets are very aggressive birds. Over the last month or so there have been fewer and fewer Lorikeets in my Grevillea tree. They have been driven off by extremely aggressive Noisy Friarbirds! The Friarbirds sit on the top branches and seem to warn any other birds that the tree is theirs! I don't know if this is a normal "pecking order". Yesterday I found part of the reason! I heard small bird noises down in that area of the garden and when I looked I found this nest. I first discovered it because of the piece of paperbark that was not properly fitted around the nest and hangs down below it. 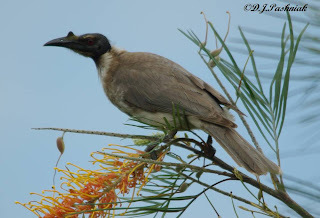 When I went closer to look a Noisy Friarbird flew off. 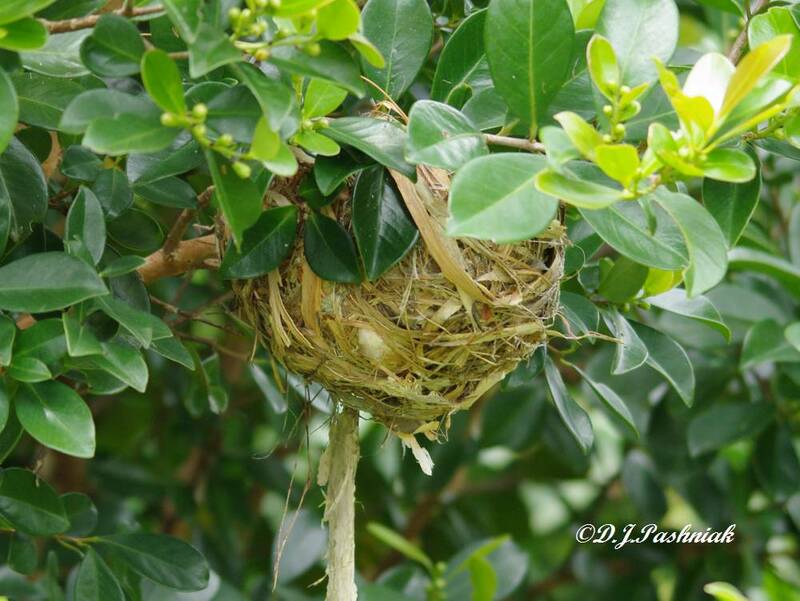 I can't see into the nest as it has been carefully constructed so that it is behind some leaves. I climbed up on a step ladder - far enough away that I would not be too much of a disturbance - and I can see baby beaks waving around just above the rim of the nest. To see more I will have to wait until the young birds get big enough to move out of the nest. There was a second day of beautiful weather and I decided to go out to Inskip Point. 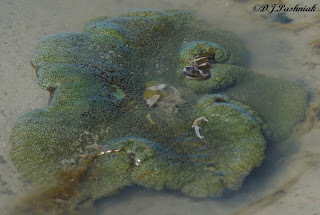 It was a very low tide and I hoped to walk right out to the sand island. Over the last couple of months there has been a lot of sand moved around and access to the island is now only at extremely low tides. This is the first time in two or three years that I have seen a change as big as this in this area. I walked out over what looked like sand but must have been mud underneath because I kept sinking over my ankles. There were very few birds feeding over this area - just a few Godwits, Whimbrels, and Curlews - birds with long bills that could get down below the mud. 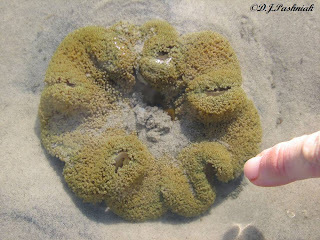 I didn't seen any smaller ones at all until I got out onto the island and went over to the western side where the sand was firm and clean. 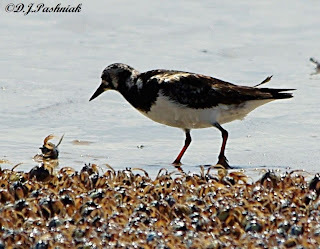 I found a small flock there of Red-necked Stints, Red-capped Plovers, and Ruddy Turnstones. 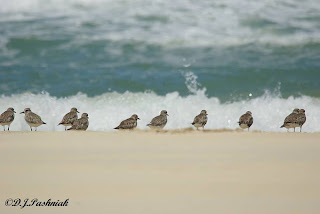 As I approached they retreated down to the edge of the water but when I stood still and simply watched them they spread out over the sand again and even came back much closer to me. 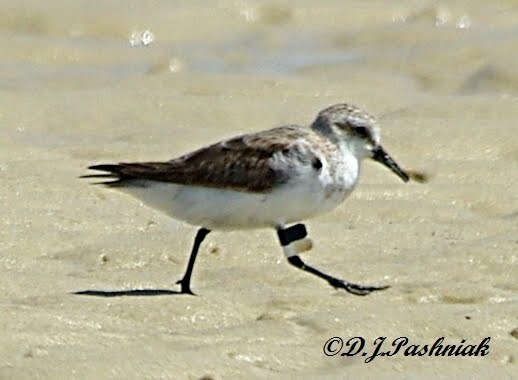 I had a quick look at the Stints and Plovers and found this one with flags on its leg. From the color combination it has been flagged in China. There are always lots of Soldier Crabs running over the sand. 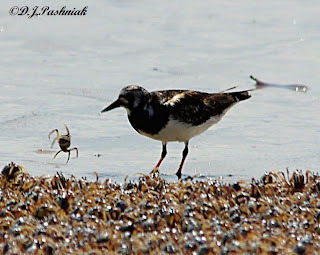 The Stints and Plovers were spread out over the sand pecking up food away from the crabs. 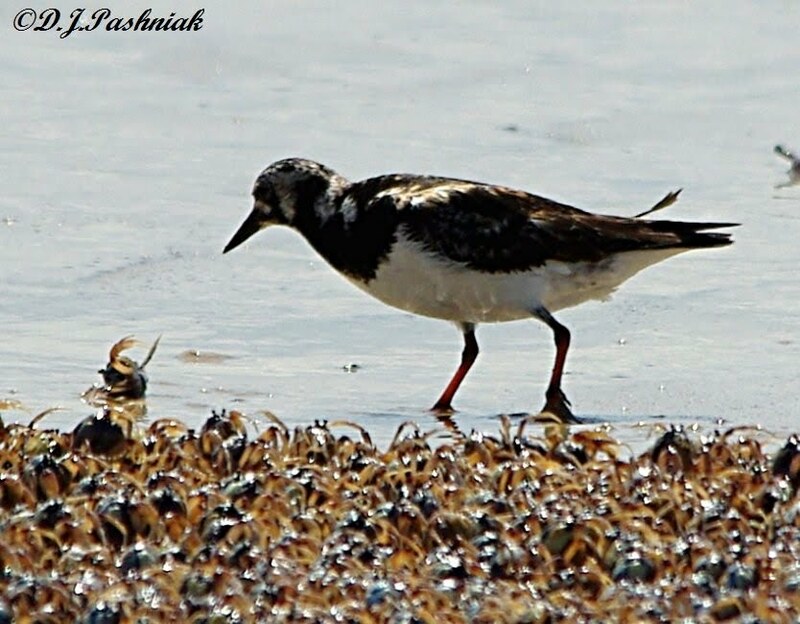 However the Ruddy Turnstones seemed to be getting food right close to the crabs. 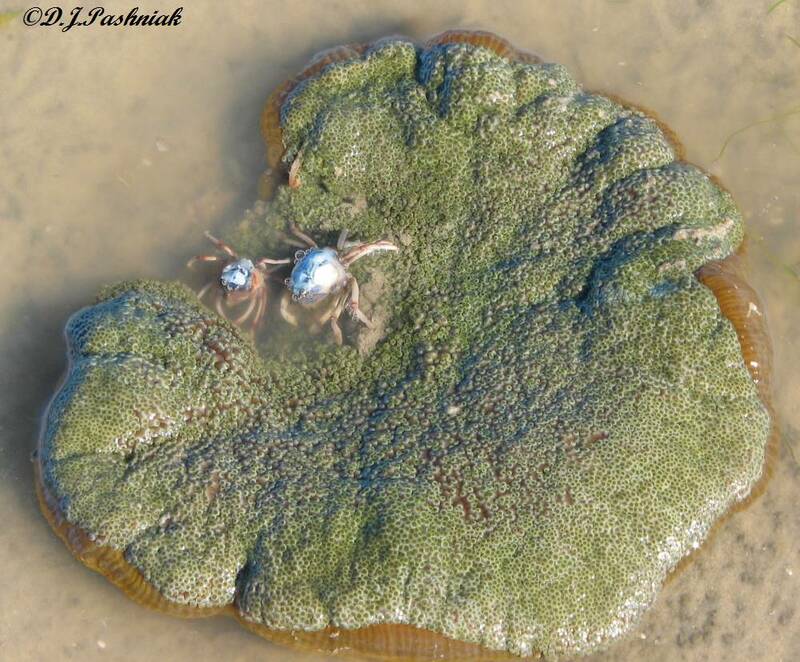 When I focused in on them I found that they were actually catching and eating crabs. They seemed to go after a crab that was away from the group - maybe it was easier to target one that could not hide out in among the rest. The following photos were taken within a couple of seconds. Is that a leg or a nipper in the last photo? 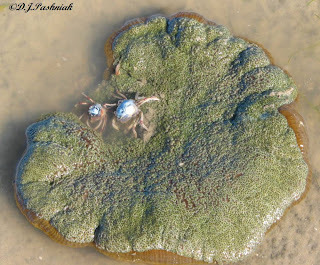 After a few pecks like this they simply broke the crab right open and demolished it! 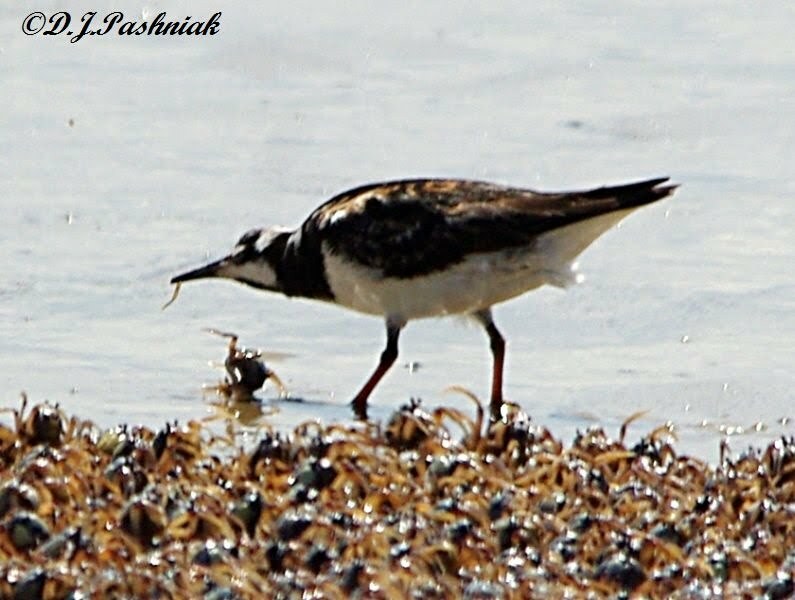 I have not seen other shorebirds eating crabs like this although they will all take the occasional peck at the very small ones. 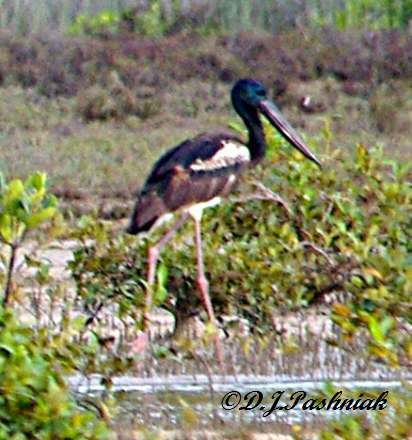 The Black-necked Stork (Ephippiorhynchus asiaticus) is not commonly seen around our area. 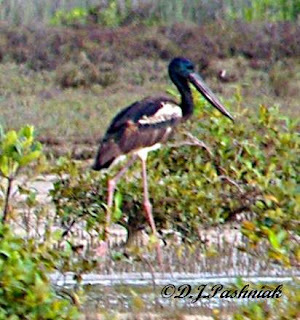 I have occasionally seen a single bird which has not stayed around for long. However, over the last couple of weeks there have been a number of these birds around the bay. I saw one a week ago in the Crab Creek area and there have been up to 5 in the Mullens Creek area. Each time I was told about the birds in the Mullens area I was told they were there "yesterday". 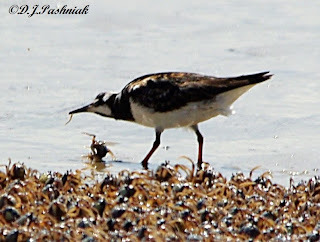 This morning I finally got lucky and there were 3 out on the saltmarsh flats. One flew off very quickly but the other two stayed on the far side of the bay where I could see them and get very distant photos. One bird was an adult with the typical adult red legs and the other was a juvenile bird still showing some brown plumage and with less white plumage then the adult. This is the closest I have ever been to one of these birds but - sometime - it would be great to be even closer and to get much better photos.